they take up a lot of valuable space in my pantry. when I don't make dishes that use the whole carton I have to freeze the leftovers, or store it in the fridge and hope I don't forget to use it in a few days....otherwise it becomes bin fodder. sometimes you just want to add a flavour boost without adding too much liquid. Many of you might wonder why I don't just use stock cubes? I don't trust what's inside them. I mean what does "chicken style" mean anyway? If I'm having to use a pre-made chicken stock I want it to be made with real chicken! So to test these stock pastes out dinner I made one of my favourite quick and easy recipes - a one pan risoni dish. Using risoni and stock as the base you can then add whatever you want be it chicken, beef or even prawns. 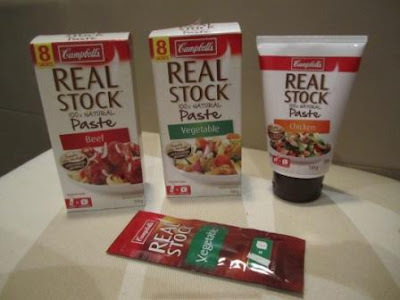 This time I made a vegetarian version with the Campbell's vegetable stock paste sachets. 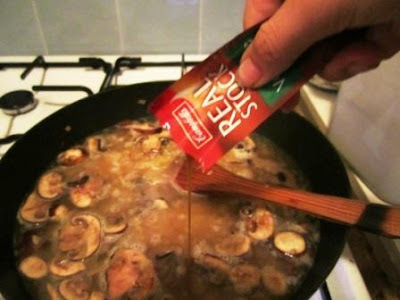 After pan frying some onion, garlic and swiss brown mushrooms, I add risoni and some water and then just squeezed in a sachet of the paste into the pan. Heat olive oil in a large deep frying pan over medium heat. Add onion and cook, stirring, for 5 minutes or until soft. Add garlic and mushrooms and cook, stirring, for 2 minutes. Add pasta, water and stock paste. Bring to the boil. Reduce heat, cover and simmer, stirring occasionally, for 8 minutes. 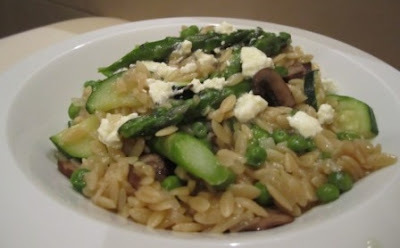 Add peas, asparagus and zucchini. Cover and cook, stirring occasionally, for 4 minutes. Uncover and cook, stirring, for 1 minute or until vegetables are tender and stock is absorbed. Divide among serving bowls and crumble over feta.